The tires on your Chrysler, Dodge, Jeep, Ram are exactly where the rubber meets the road so it is important to take good care of them. If you notice a pull to one side while driving straight down the road, it is likely that you need to stop by our Service Department at Eddy's Chrysler Dodge Jeep Ram for a wheel alignment to keep your tires from wearing unevenly. Keeping a good grip on the road is important so when your tires start to run low on tread, stop by and let us replace them with tires specifically designed for your Chrysler, Dodge, Jeep, Ram vehicle. If you have had a flat, we can often repair the tire quickly and easily and if you notice a vibration from the wheels, let us take a look at your wheel balance. Frequent rotation of your tires is not only recommended by the manufacturer, it is also one of the best ways to ensure the longest life from your tires. 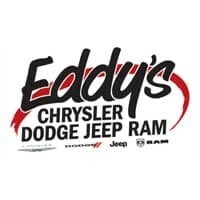 Our Service Department at Eddy's Chrysler Dodge Jeep Ram is a state-of-the-art facility with the full capabilities one would expect in a comprehensive tire shop. Schedule an appointment for MOPAR tire repair today or simply stop by and see us in Wichita, KS. Be sure to check with us regularly as our specials are always changing.